Have you ever been in a room that didn’t feel good to be in but you couldn’t figure out what was wrong? Chances are the Yin/Yang components were out of balance. By learning some simple concepts you can arrange each room of your home to support the activities and needs of the people who live there, creating a greater sense of harmony, comfort and balance. Yin and Yang are at the foundation of the Ancient Practice of Feng Shui. It has to do with the recognition that the universe is made up of opposite forces of energy which cannot exist without each other. They are finely balanced and, like polar sides of a magnet, are innately attracted to each other. The Yin/Yang symbol depicts two fish gliding together in perfect balance. Each is carrying components of the other; the black fish with the white eye and the white fish with the black eye. They swim together in perfect harmony creating a circle, the most ancient symbol depicting wholeness. Feng Shui acknowledges that we are ancient creatures who naturally seek balance. If our living spaces are not balanced, our lives feel out of balance as well. By learning to work with the Yin and Yang components in our homes, we create supportive spaces that bring our home into balance, setting up a template that also brings our lives into balance. 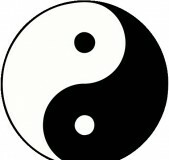 The concept of Yin refers to the qualities we attribute to the feminine principle which is passive, dark and yielding. Yang refers to the qualities we attribute to the male principle which is bright, active and extroverted. So what does this all mean in terms of applying it to physical environments? First we identify the use of the room, i.e. is it an active or restful space. Then we incorporate objects, shapes, colors, furniture and art that supports activity or restfulness depending upon which quality we are working with. If it is a restful room we would want to incorporate more Yin features. In active spaces, we would want more Yang features. The key, however, is to make sure we always have some of both qualities and not an over abundance of either. Yin objects to add to the space to make it more restful would be circular-shaped objects; darker, more muted colors; lower, darker and more cushy upholstered furniture; fabrics of soft chenille, velvet and corduroy; as well as fabrics with more detail. You can also add carpeting and area rugs, patterns and more circular shapes, such as floral prints. The lighting should be more muted and the paint colors softer or greyed-down. In building materials, adobe, brick and stucco would be considered more Yin materials. In design history, the eras that incorporated Yin qualities would be the Victorian era, Louis IV and V, and the Baroque period, all which incorporated curved lines, plush, over-stuffed furniture with lots of detail and intricacy. You can fix a room that is too restful and should be more active by removing patterns with detail and creating straighter, more modern lines with art and furniture, removing area rugs and pillows, and weeding out some of the plants and the smaller collections of things. Think of making it Zen, with more empty spaces that breathe (clutter clearing included!) A bigger fix would be to paint the walls whites, pastels or brighter colors, removing the carpeting and bringing in hardwood or tile, replacing curtains with light-colored shutters and opening up the room to bring in more light. 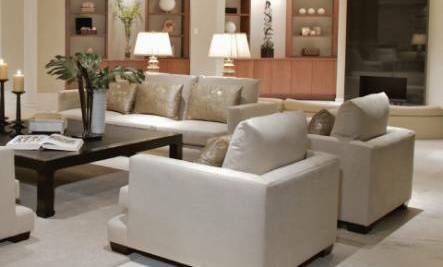 To create a more active space, you can incorporate brighter lighting, whites and/or bolder colors, more angular or square-shaped furniture that is not upholstered and accessories with less detail and straighter lines. Bold stripes and geometrical shapes in larger prints would be considered more Yang qualities along with slicker leathers, plastics, vinyls, silks and synthetics. Yang materials would be hardwood, cement, tile and any hard-surface materials. The more highly manufactured materials such as glass, metal, and plastic are also considered more Yang. Think of a modern room with high ceilings, a lot of glass, light and metal, with angular shapes and straight lines. The period in history that introduced more Yang features into architecture would be the Bauhaus era in Germany in the 1920′s, the precursor to our modern-day architecture. This dining room is much too Yang. They need to be calm spaces where we nurture our bodies. Knife-edged, "unfriendly" furniture does not belong anywhere in our space. If you are attracted to a more Yang, Zen and clean look, make sure to still incorporate furniture with more rounded edges. Sharp-edged furniture is considered weapon-like in Feng Shui. Our homes always need to be “people-friendly” no matter the style of decor you are drawn to. A good rule of thumb is if you can bruise yourself, stub your toe, bump your head or knock into it and injure yourself, or if it looks like or is a weapon, it is not considered friendly and should be removed from your living space. Modern Spaces Still Need Nature! The downside of much modern architecture is that it does not often bring in the natural world. As people who came from 100,000 generations of ancestors who lived in nature, we don’t feel truly “at home” unless we have it represented in our living and work spaces. This is a part of the Five Elements teaching and an integral part of Feng Shui. Bring in photos of nature, plants, animal prints (faux only please), shells, wood, earthen-ware objects, and water features to make your Yang space more inviting. You can fix a room that is too Yang and should be more restful by bringing in chenille and/or cushy pillows and throws in muted colors and earth tones, more detailed fabrics, adding plants and trees, nature art, and area rugs. For a bigger fix, paint the walls a restful, darker color and create more muted lighting and bring in darker window coverings. Think of creating a cave-like, comfy space that inspires you to want to curl up and read a book. Remember, the key is to have a balance of both Yin and Yang qualities in every room, emphasizing more Yin or Yang features depending upon the use of the space. Your very-bright, Yang bedroom will not support rest and rejuvenation and your dark and cozy Yin home office will not support you getting anything done. Knowing how to apply Yin and Yang principles to your home will support the needs and lives of the people living there and allow everyone to flourish. Once you have achieved an appropriate Yin/Yang balance in each room, you will be well on your way to creating a balanced and harmonious home that supports, uplifts, and nurtures your lives! See my article Applying the Feng Shui Five Elements to Your Home for more on the Five Elements. By Erica Sofrina, Author of Small Changes, Dynamic Results! Feng Shui for the Western World.